During holiday break we took the boys to Martin Luther King Jr. National Historic Site and The King Center. Peace, justice, and human rights around the globe are important to my husband and me. Very important. So now, as our oldest enters First Grade, it was time to bring him to learn more about Dr. King. We parked at the lot off Boulevard. It was free. As we walked toward the Visitor Center, we passed the Civil Rights Walk of Fame. At the end was a life-size statue of Gandhi; he was a great influencer to Dr. King. This beautiful mural is right outside the visitor center. Inside the Visitor’s Center. I love this setup. It gives an idea of what it must have been like to see him in the 60s. This is the Children’s exhibit in the center of the building. There are multi-media pieces, with hands-on facets as well. This is the main exhibit in the center for adults, but my First Grader enjoyed it, too. The very wagon that carried Dr. King’s casket! Dr. King was not just an advocate for civil rights. He wanted peace across the world, between cultures and nations. This is an important photo, to me. It was the part of the museum in which my 6 yo “got it.” Why was he in jail? Why didn’t they want him to march? But he didn’t do anything wrong. Why were they mean? Was he scared? How long did he stay? I teared up. I didn’t have answers…only more questions. But his eyes were opening. I was glad…but sad…we left a bit of his innocence at that place on the carpet, in front of a make-believe jail cell that felt more real than ever. Each of the exhibit kiosks in the “adult” exhibit has a blue sign like the one below, which helps younger children explain the section. Honestly, these signs in the adult exhibit touched my son much more than the children’s exhibit. Just outside the visitor center is a rose garden. We visited in winter, so the roses were not blooming, but we still enjoyed the peace-centered poetry written by children from around the world. This is the active Ebenezer Baptist Church. The iconic church of Dr. King is across the street. 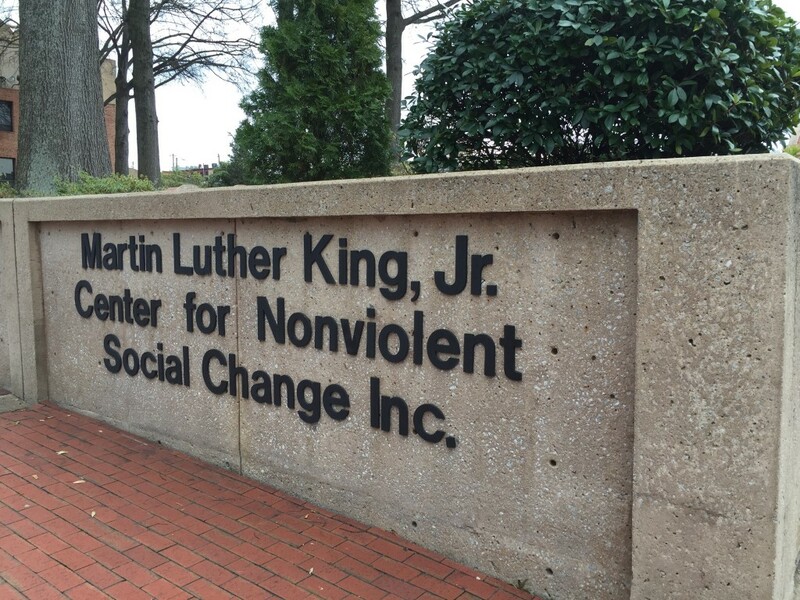 Next door is The King Center. This is not part of the National Park, but is an integral piece of the story. Dr. and Mrs. King’s tombs are here, as is the eternal flame. Across the street is the No. 6 Fire Station. Dr. King played here as a young boy. It was also one of the first fire stations to desegregate. And only a bit up the road, we saw Dr. King’s birth home. We were too late in the day to tour it…get there early for tickets. They are free, but they go fast! I highly HIGHLY recommend a visit! Read a few books with the kids before you visit, if they are not familiar with Dr. King. Help them grasp the importance of a man that preached peace and love. UPDATE: I only learned about this after our visit, so I don’t want you to overlook it. There are Junior Ranger Activity booklets available for free at the Ranger Station. They give kids a guide to the museum and include activities and some help in explaining struggle for Civil Rights. Don’t miss the trading cards, too, and the chance to stamp your National Parks Passport. 2 Comments on "A Picture Tour of Atlanta’s Treasure: Martin Luther King Jr Historic Site"
Thanks! I’m gonna do this with my nephews tomorrow! Awesome! Look forward to some pictures!